Just Take A Look At Our Marvelous History Of Interesting Doll-Related Programming! 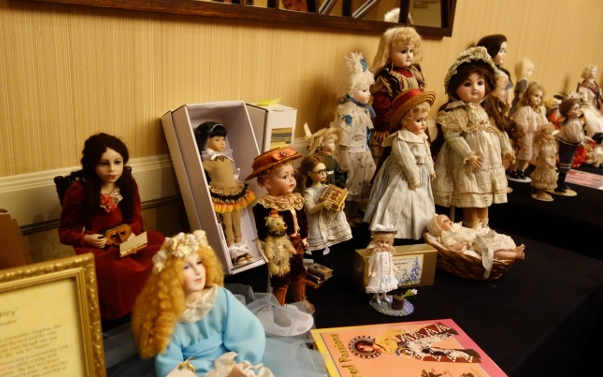 Our member presented a fun program called "Not Your Grandmother’s Dolls." 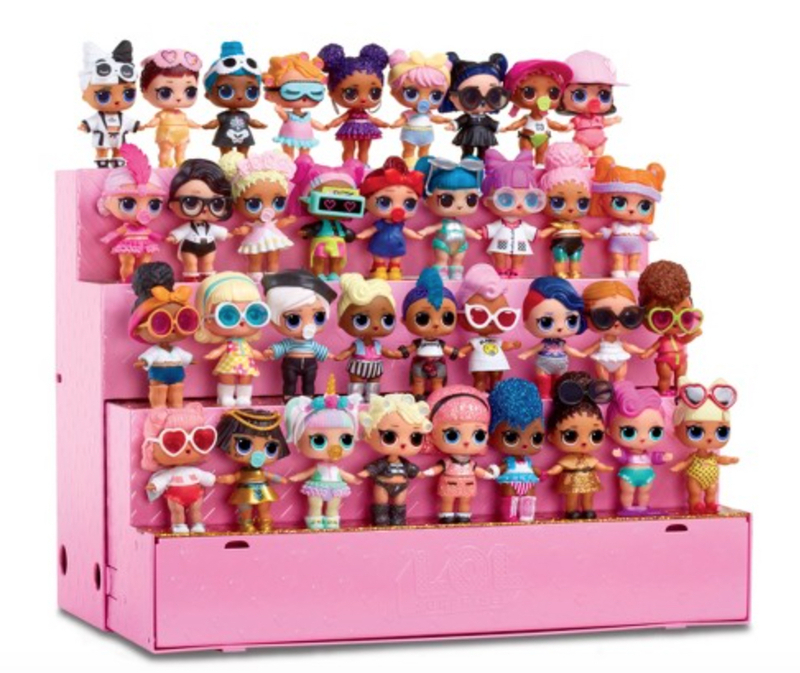 LOL dolls are extremely popular among the preschool to elementary set. They launched in November of 2016 and they continue to sell out even now at department stores. The company has never paid for advertising but they have borrowed on the success of the surprise egg and unboxing videos on YouTube that are watched by millions of children and adults worldwide. The surprising thing about the LOL dolls is that they are presented in a ball, capsule, or hair spray can. Because of their blind packaging, you don’t know what you are getting until you peel away the 7-9 layers to get to the doll. This adds both to their intrigue as well as their marketing potential. Thank you for this very informative and timely program. 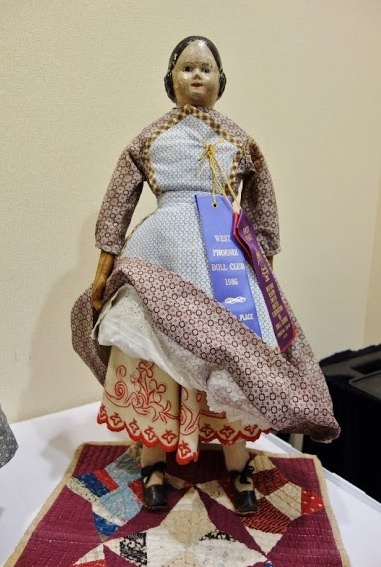 Two members presented a program on Belton Dolls. 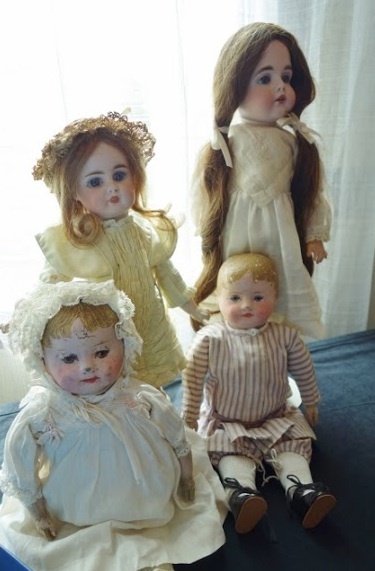 These dolls were made in Germany in the late 1800s and have closed dome heads. They were made by no specific manufacturer. We were shown a great PowerPoint program with pictures of many different types of dolls. On display were many beautiful dolls shown without clothes and wigs to better examine their different bodies. Thank you so very much for this interesting this informative program! 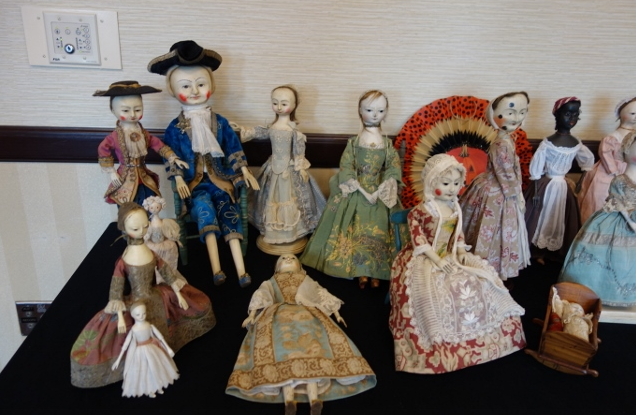 And also thank you also to members who brought Belton dolls to show. 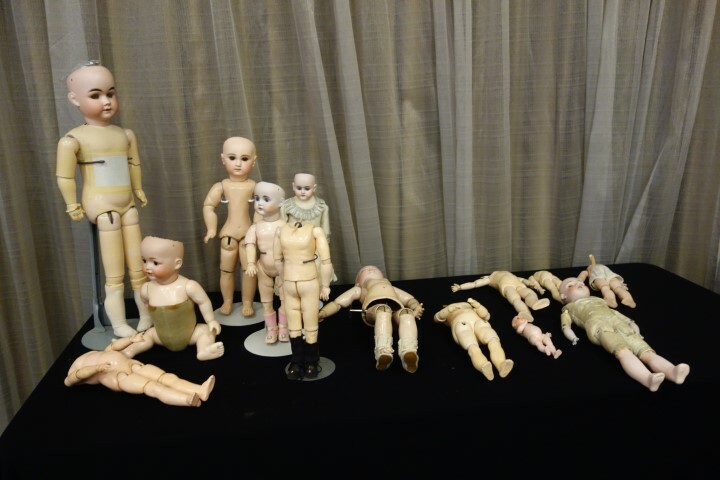 A member presented “The Full Monty: Composition Doll Bodies Exposed... or... What happens in the doll cabinet when the clothes come off? What is the appropriate body for a head? The earliest composition bodies were made in 1875 by Jumeau. Our presenter described 6 different body types using a slide show. Many bodies were comprised of composition and wood. French bodies used 8-10 ball joints. Thank you so much for this delightful presentation and display of the different types of doll bodies. Thank you also to all who brought other examples of doll bodies. Two members presented a delightful program on the history of Christmas trees and holiday decorations. 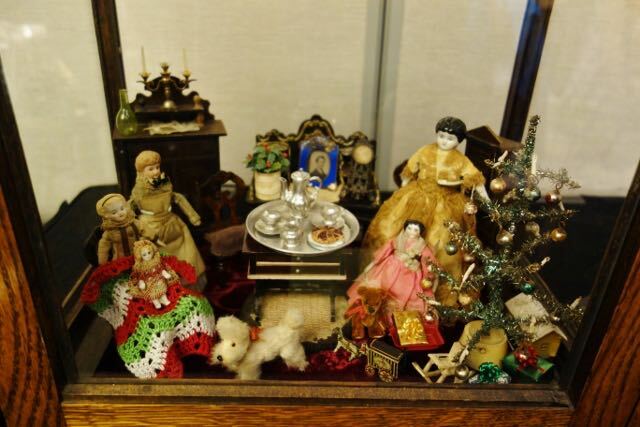 We held our annual Holiday Doll display contest, and many members brought in their seasonal vignettes. We also shared our collections of vintage Christmas decorations for show and tell. Happy holidays everyone, and here's to a great 2019! A member presented “That Wonderful Sasha.” The talk and powerpoint was focused on the creator, Sasha Morgenthaler and her dolls. Sasha was born 1893 in Switzerland. As a child she wanted to her dolls to portray emotions other than happy smiles, to that end she filed some doll lips to make the change! As we see the final Sasha faces, they have a neutral look. 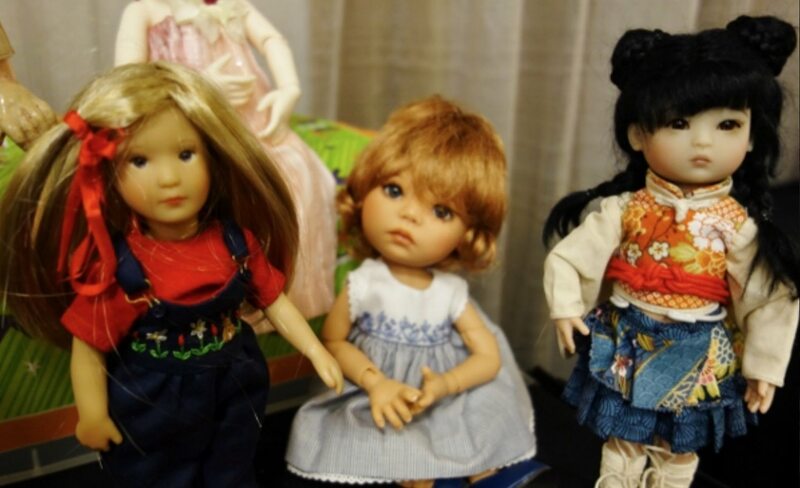 The manufactured Sasha Doll was done by several companies and there were examples of these dolls and their markings. Our presenter treated us to many interesting facts about Sasha’s life and brought her fabulous collection of Sasha dolls and clothes for us to see. Thank you so very much to our presenter! Thank you also to all who brought dolls for show and tell. The Life of a Bavarian Peasant Doll was presented by one of our members. Her program was filled with so much interesting information about the traditional aspects of “Bauern” culture (German word for farmer.) There seems to be more interest in peasant dolls these days due to the current focus on ancestry. She displayed many lovely pictures of the idealistic European farm life of the past. In our present day, world farms are disappearing all the time, being replaced by huge corporations. Our presenter made an excellent suggestion that we all do what we can to support our local farms. 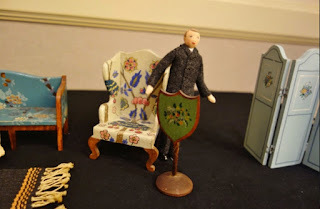 She also brought a wonderful display of her peasant dolls, animal, and dollhouse rooms with painted furniture. Thank you so much for a delightful and informative program! Thank you also to all who brought dolls for show and tell. We held our annual Summer Finds program where each member brought in some highlight purchases from the past few months. It was like a giant show and tell for adults, full of surprises, stories, and ooohs and ahhhs! Thanks to all who participated! Our June program was on Old Cottage Dolls. 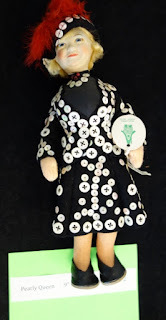 The history of doll artist Margaret Fleischman was fascinating. She was born in Czechoslovakia in 1899 and went to art school to study textiles and antiques. WW2 and the rise of the Nazis forced her family to escape their homeland. They finally arrived in London with $2 in their pocket. Jobs were difficult to find so Margaret came up with the idea of making dolls as a home business. From 1940 through 1981, she created lovely dolls in beautiful clothing. 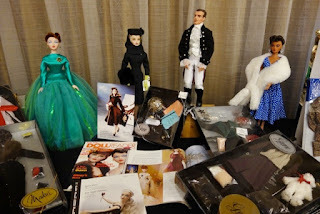 Our presenting member brought a fantastic selection of her dolls for us to see and appreciate. Everyone learned something and really enjoyed this outstanding program. In May, we held our annual DSCB fundraiser event. We had 71 total people register and pay to attend. Most attendees were from Region 15, but others came from all along the East Coast. We were very honored to have current UFDC leadership in attendance, including Ada Diedrich (DSCB President, past Region 15 RD, and past UFDC President); Susan Voake (current Region 15 RD); and Dr. Barbara Stone (current UFDC Vice President.) Many former Region 15 RDs also came. A great time was had by all and we hit our financial and attendance goals. Thank you to everyone who volunteered before, during, and after the event to make it possible. A member presented the fantastic and wonderfully produced video “Here Come the Brides.” First it showed pictures from the Pilgrim Hall Museum’s (Plymouth) exhibit of four centuries of wedding fashions beginning in 1621. Then we saw interesting historical tidbits and stunning pictures from The Victoria and Albert Museum book. 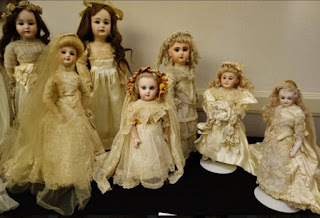 Lastly, we viewed gems from Nancy Price’s book, “Something Old.” Finally, we shared beautiful bride dolls from out own collections, and some members even brought along their own wedding day pictures. Thank you everyone for your participation! Such fun - and everyone truly loves a bride! A member presented the program “Bathing Beauties.” When the Victorian era changed to the Edwardian era clothing became more natural. Women playing sports started to become accepted. One could actually go to the beach in a bathing suit! Unfortunately some of these suits were wool and could weigh 30 pounds when wet. Also, women had to wear black stocking that covered the whole leg. This was required wear. The first bathing suits were impossible to swim in. By the 1920’s, beach wear made more sense. 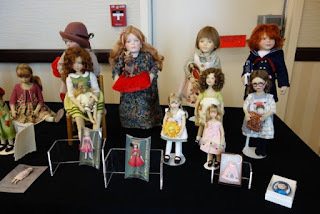 The presenter brought her collection of bisque doll/figurines for us to see. These beauties are mostly from the 1920’s. They are hard to find with fabric bathing suits still intact. Apparently she fell in love with them at our Regional last year and now has a fabulous collection. Thank you for this wonderful program! And thank you to those who brought their own examples of bathing beauties. February’s program was "Favorite Doll Artists." A member presented her Valentine’s Ladies Dolls. Pamela Valentine and her husband Noel designed and created gorgeous outfits for dolls from the 1970’s to the 1990’s. They were based in the San Francisco area. For her research, our member was able to talk to Pamela. She said she was inspired by art history, period fashion books, period movies, and fabric. At one point she taught the Art of Doll Making. These dolls had a layer of buckram under their long skirts which was stiff enough to support the doll, so no stand was needed. 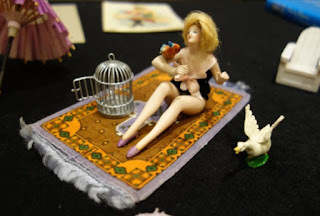 Another interesting fact is that Wendy Lawton started out painting dolls for Pamela. Thank you so very much for the very interesting program and for everyone who brought wonderful artists dolls for us to see, appreciate, and enjoy. A fun and informative program on “Barbie: Mid-Century Modern” was presented by two of our members. They showed pictures of Ruth and Elliot Handler, the founders of Mattel. This couple married in 1938 and their 2 children were named Barbie (Barbara) and Ken! From the beginning of Barbie in 1959, through the years of all her glorious changes, we saw interesting pictures and many actual dolls on display. Thank you so very much to our presenters! Also thank you to everyone who brought dolls for show and tell. A member presented “Christmas Traditions Around the World as Relating to America.” Many of our Christmas traditions come from Queen Victoria and her husband Albert, who was German. The greenery we use started in the Dark Ages. The earliest “fake” trees were made of goose feathers. Our presented shared numerous, amazing facts about American holiday traditions and their origins. 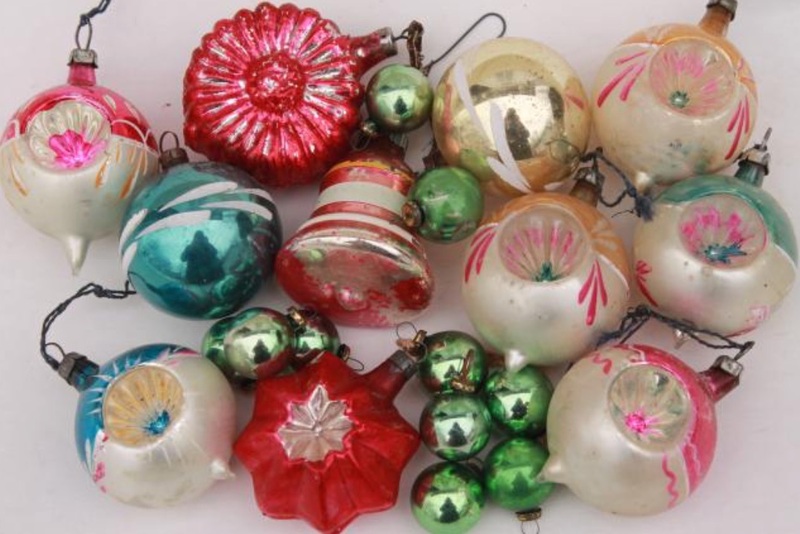 For example, the earliest tree icicles were made of lead, and Woolworth’s was the first importer of blown glass tree ornaments. We all so appreciated this very interesting and timely program. One of our members gave a wonderful and informative program on Steiff Teddy bears from 1903 onward, called “Can You Bear It? 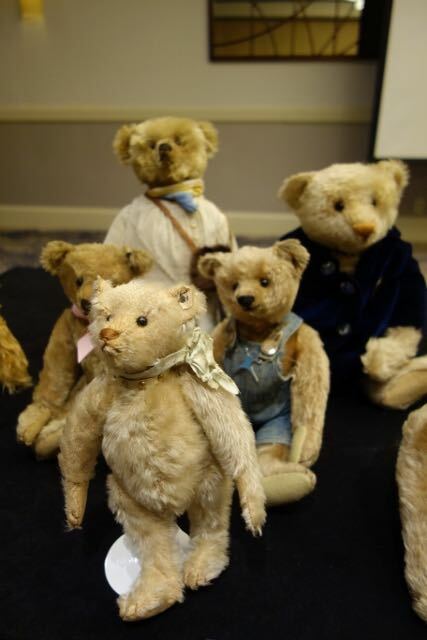 A Steiff Teddy Master Class.” In 1897 Richard Steiff, Margarete Steiff’s nephew, began at the company. By 1902 the first bear was produced. This bear was 20” and rather heavy for a child. It was not too popular. None have actually been found! There are only pictures. As time went on changes were made to the bears produced and they became more and more popular. An interesting bear was produced in 1912, the Titanic Mourning Bear. At the time it was said that 1 person in 6 was touched by the sinking of the Titanic. This bear was black and it is very rare to find one today. Thank you so much to our member for the fun and interesting program and for bringing their fabulous examples for us to see! Almost everyone in attendance took part in our Club's annual Summer Finds program. 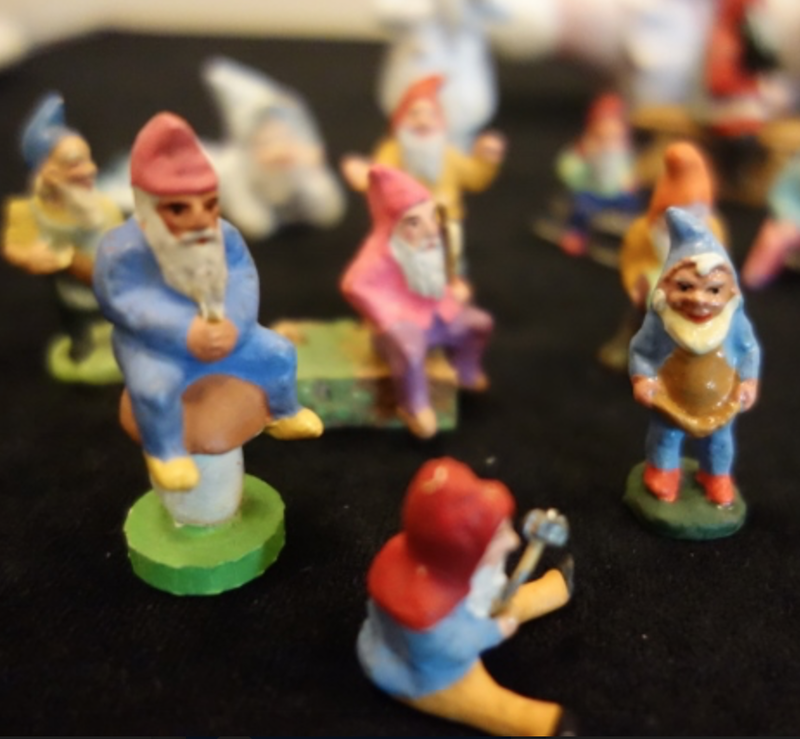 It was great to see the wide range of items our members brought to this show and tell session, and equally as interesting to hear the back stories behind these new acquisitions. Thanks to all who participated! Linda Edward from the Ida Lewis doll club presented “The History of Tynietoy.” This company produced dolls, furniture and dollhouses. Marion Perkins and Amy Vernon founded the Tynietoy Company in Rhode Island in the 1920s. They began making high quality wooden dollhouse furniture, eventually creating dolls and dollhouses. Linda said she searched for the Tynietoy mansion for 40 years before finding one for sale! By the early 1950s, Tynietoy had dissolved. Tynietoy dollhouses and furniture are (mostly) stamped with a trademark underneath and have become highly collectable today. Thank you so much Linda for your wonderful presentation and bringing of your fantastic collection for us to see! This was our first meeting after our marvelous Regional Convention, held in May. We celebrated the 65th birthday of Doll Study Club of Boston with a lovely cake and party hats! Many members brought in dolls that won ribbons at this event, or dolls purchased from the event's sales room for show and tell. “What Else Do You Collect?” was our April program. We had a fun time listening to the stories & seeing the collections of our members. Many members also worked on the remaining projects for the Regional. Thank you so very much to all who helped! 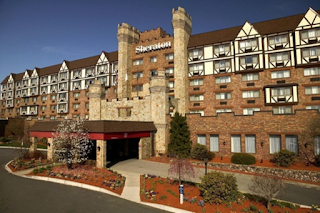 We were at the Sheraton Framingham Tara hotel for our meeting to tour the areas our club would be using for our May Regional event. The ballroom is beautiful! Volunteers received their assignments for the Regional. Four tables of members worked on various tasks in preparation for this event, including cutting, taping, ribbons, bagging, and folding papers, items, and collateral. Thanks to all who helped! 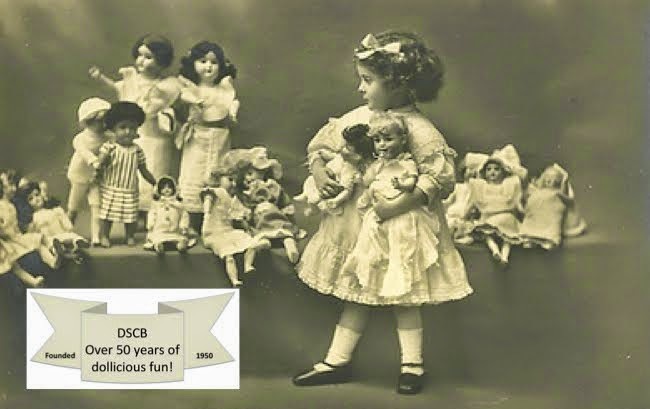 Two members presented a program on “Character Dolls.” Before 1908, most children’s dolls were pretty. That year in Munich, Germany, there was contest for people who were not currently making dolls to portray children. Marion Kaulitz won a citation for “most original dolls” in 1911. The movement declined around 1912 when people realized children were happier with “pretty” dolls than realistic ones. K Star R (Kammer & Reinhardt) starting making dolls in 1865 and mass-produced “character dolls.” They thought the art doll movement was a good idea, and had a university sculptor instructor secretly sculpt their doll heads. 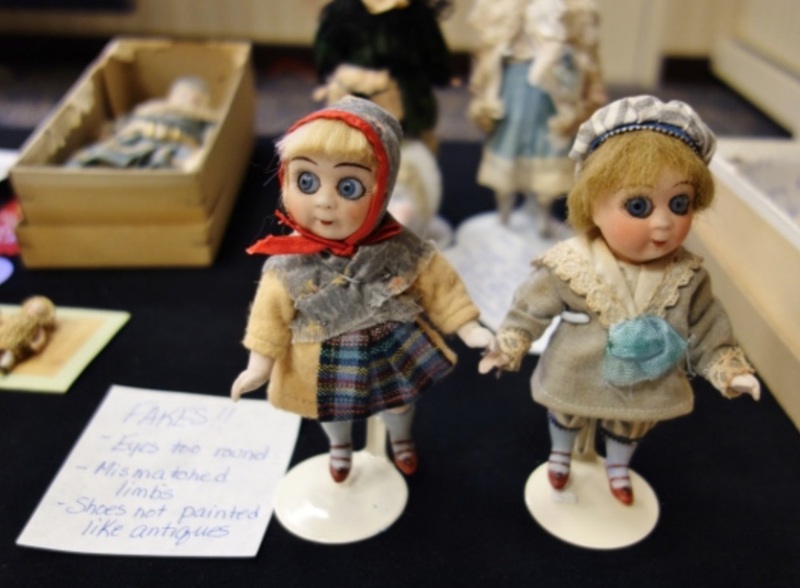 There was a large demand for these dolls until WWI when sales dropped. Turns out, children liked sleep eyes and hair you could play with! The presenters brought a wonderful array of character dolls for us to see. 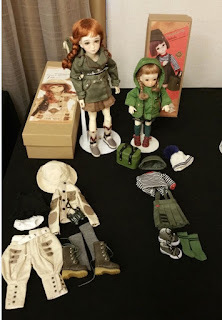 Thank you so very much for this interesting and informative presentation, as well as to everyone who brought their own character dolls in for show and tell. 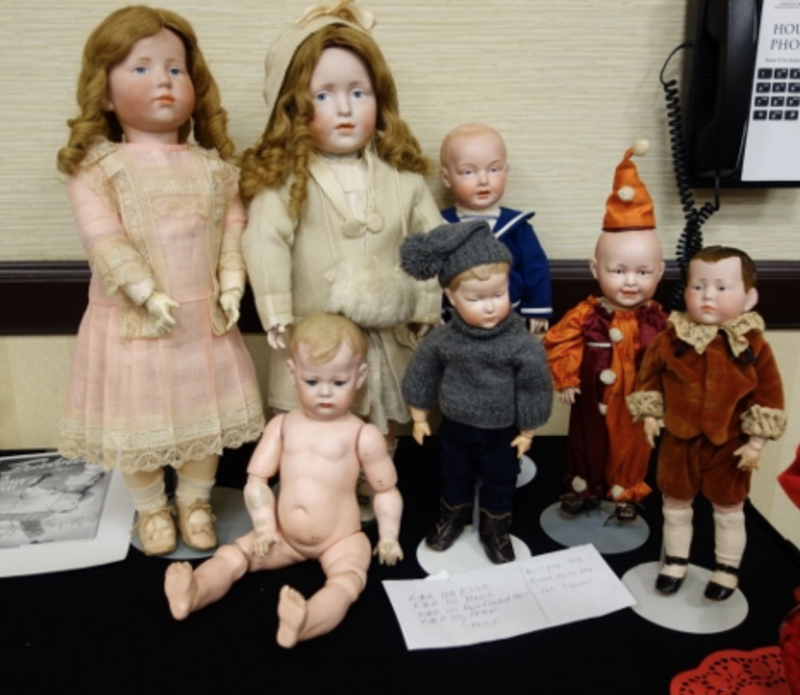 “Fakes, Frauds & Franken Dolls” was presented by one of our members. On display were many German dolls that looked old but were made to look that way to fool an unsuspecting buyer! Our presenter had a slide show of many examples of these dolls found on eBay. Some things to look out for include: unnatural looking dirt, dirt under the skirt, and darker painted lips. True old dolls are grey, not yellowed. Fake dolls are in presentation boxes that are too large. We hope her information can be printed in a Doll News article because too many doll collectors are being scammed! Thank you for presenting this exceptionally informative and very important program. The meeting was cancelled because of bad weather conditions. The Art of the Doll was presented by one of our members. Art dolls are works of art & are not intended as playthings. They are one-of-a kind and completely handmade. 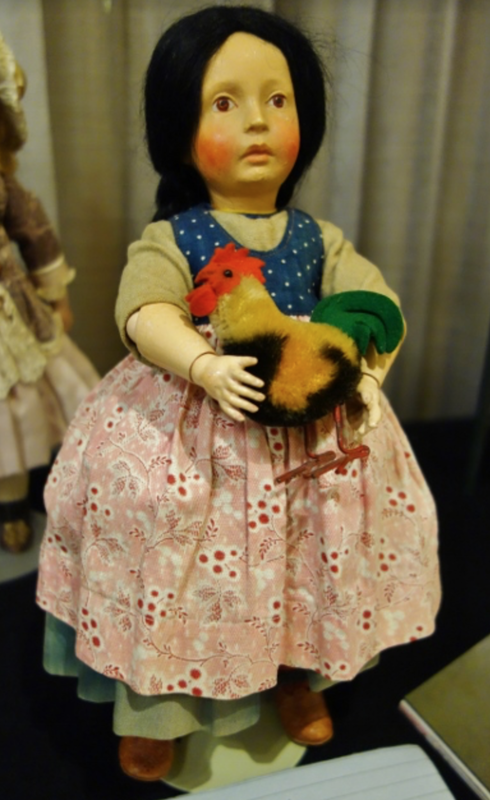 Some examples of doll artists include Dorothy Heizer, Kathy Patterson, and Michael Zaykov. 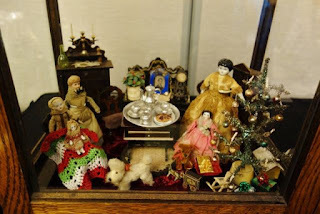 Kathy Patterson started out making reproduction German Santas and Besnickles, then Izannah Walkers, but found her true passion in creating the 17th and 18th century style woodens. We were treated to stunning pictures of the work of these doll artists. See www.NIADA.org for more information on the National Institute of American Doll Artists. After the program members talked about their favorite artist dolls that they had brought. Thank you to our speaker and everyone who brought their dolls for show and tell. We all had a fun Halloween party for our October meeting. 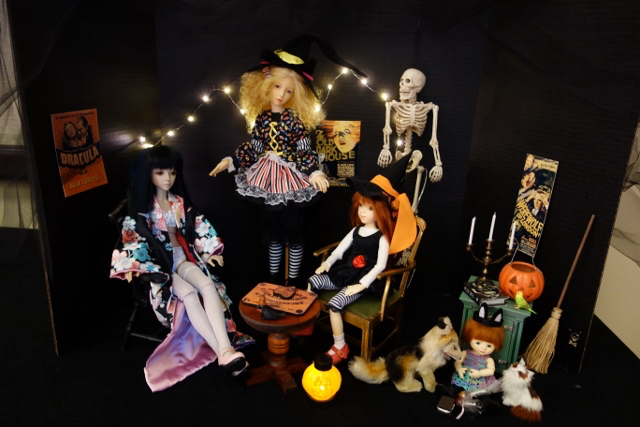 Many members brought dressed dolls, Halloween displays and amazing collections of Halloween memorabilia! Some members dressed up, several as witches! Thank you to a special member who again graciously provided table centerpieces and treats. Our September program was all about “summer finds,” which is our annual topic for our first fall meeting. 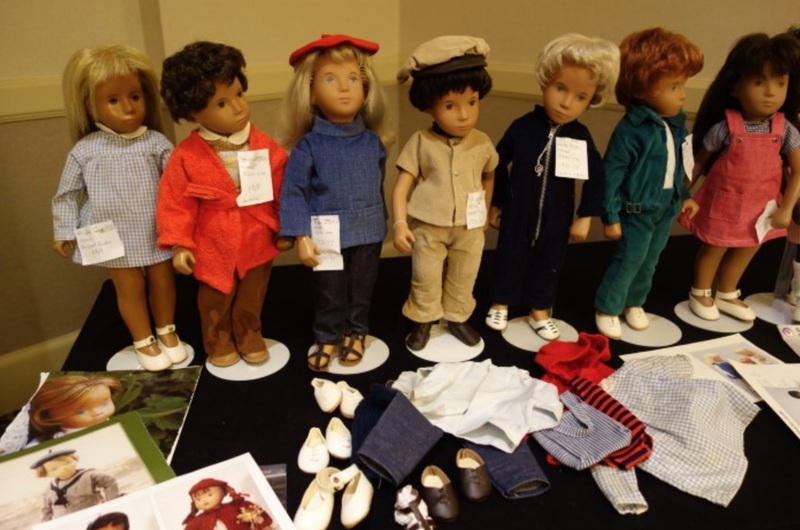 Members shared dolls that they had purchased over the summer, won at auctions, finally paid off over time, as well as those that they found in the salesroom at our National Convention in DC. Several brought souvenir dolls from meal events held at National. Several members presented the 2016 National Convention souvenir publication, which was extremely well done by edition Lynne Murray. A member displayed and discussed two dolls with wardrobes that were featured in this journal that she had purchased in DC. Another member shared two delighted felted dolls and there was discussion if that could be a new category for competition, as these dolls really didn’t fit in anywhere except in the cloth categories, but they were not technically cloth. Everyone had great stories to go along with their summer finds. Thanks to all who helped to make this program so successful. 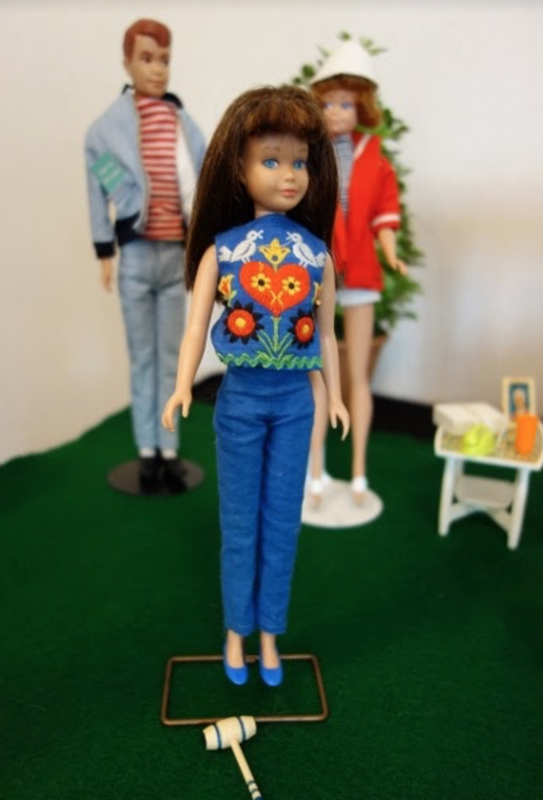 A member presented the program, “Gene Marshall: Girl Star, Her 3 Incarnations.” In 1995, Mel Odom’s “Gene” doll by Ashton Drake was first introduced at Toy Fair. Gene had a storyline; she was a young usherette in a NYC theater who was “discovered” and ended up as a movie star. The Gene doll was different from the current modern fashion doll Barbie. Barbie collectors liked to keep the dolls in their box unopened. This worked because of the plastic see-through cover on their boxes. Mel wanted collectors to play with the doll, so no plastic covers for her! Other characters were introduced; Trent, Madra, and Violet Waters. This version of Gene ended in 2005. From 2006 to 2010 Integrity Dolls and Jason Wu came out with a more articulated Gene that was produced in more limited numbers. Her third incarnation came in 2013 by Jamie Show. She was now produced in resin rather than vinyl. She had a wig cap and different hands that could be changed. 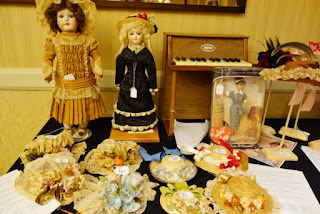 Our presenting member brought a fantastic array of dolls for us to see. Thank you so very much for the fun and informative program on Gene! Also thanks all the other club members who brought Gene dolls along for show and tell. This year our annual fundraiser was an old fashioned auction with Marcia Leizure from Withington’s Auctions presiding. Attendees could bring up to 4 items to be auctioned off. Approximately 61 people attended and over 150 items were auctioned! Beautiful table centerpieces made by a talented member adorned every table. Attendee names were drawn from a bowl, winners got to take home one of the centerpieces. Everyone received a very sweet table favor of a Steiff rabbit or bear keychain! Raffle tickets were sold to win one of 5 amazing baskets of delightful items. It appears that this years fundraiser was a success! Thank you to our event chairwho organized the event, plus all the members who put so much work into it. Thank you to those who donated items. Thank you everyone for a wonderful day! 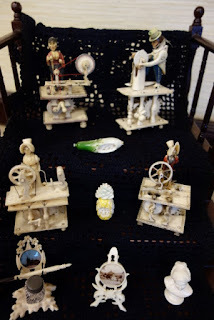 A guest from the Jenny Lind Doll Club presented a fascinating program on bone and bone-like material miniatures for your dolls and doll houses. She displayed an absolutely amazing collection of tiny miniatures. One of the very interesting facts is that in the past, Napoleonic prisoners of war carved tiny Spinning Jenny’s, with moving parts, out of the bones from their meals. The speaker told us about the history of carved ivory, cleaning ivory pieces (don’t touch, use gloves) and the story of Titania’s Palace, created in Ireland in the early 1900’s. This palace is a miniature doll palace with tiny furniture made of ivory or bone. Tara’s Palace was more recently commissioned and is on display in Ireland. Tara’s Palace consists of 22 rooms furnished with miniature masterpieces that took 20 years to create. Thank you so very much for the interesting program & the stunning collection you brought for us to see. The presentation for our March gathering was Dolls in Scottish Costume. Two members gave a talk about dolls in tartan. Both were dressed head to toe in this wonderful material. One started out the talk, giving the history of tartan in Scotland. She explained its role as both a decorative and functional material. She also spoke on how it was made and gave various examples of different tartan configurations. The second presenter then talked about her family's ties to Nova Scotia and how these triggered her love for dolls in plaid. She shared highlights from her very large collection with the club members, giving the history and stories behind several key pieces. Other club members also shared their dolls in plaid in a "show and tell" format. 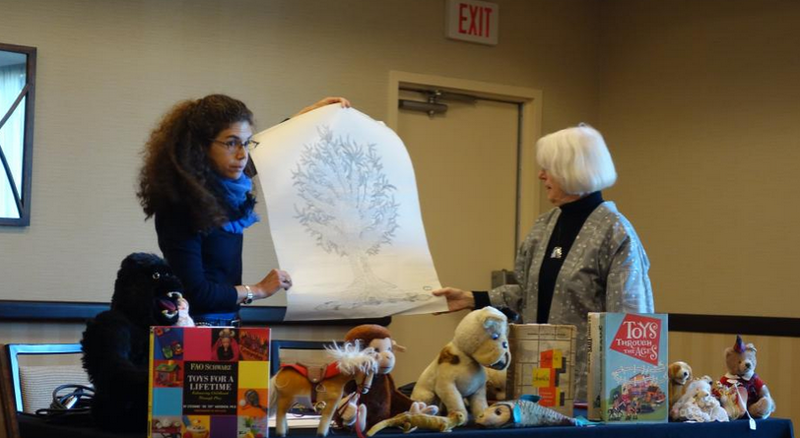 Two members presented a program about Maggie Iacono, the doll artist for our 2017 Regional! Maggie began making dolls around 1991. 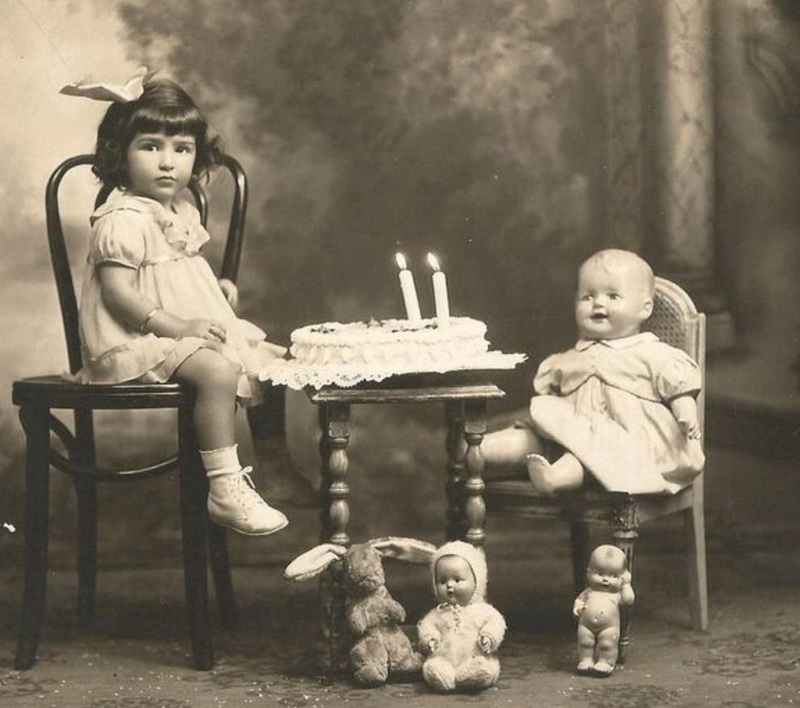 Her earliest dolls were made of felt, but their clothing was not. Her later (and current dolls) all have amazing felt clothes in addition to felt bodies. Maggie designed many fairy tale and mother-daughter themed dolls. Maggie and her husband Tony produce these dolls together, and they are completely American made. They feature wire armature under the felt, and their arms and legs are movable. Our presenters showed a very sweet, short film about a doll left home alone while Maggie and Tony were away. She had a list of chores to do, including feeding pets and taking in the mail. Thank you for this lovely presentation and to all who brought their own Maggie dolls for show and tell. 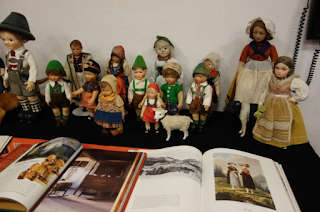 A member presented a program on "Europe's Oldest and Most Celebrated Fully Wardrobed Doll." Turns out that this is a 2 foot tall statue in Brussels of a little boy peeing! Who knew? His name is Manneken-Pis and there are many legends associated with him. And what was truly unexpected is that he actually does have an extensive and fantastic wardrobe, and was the inspiration behind the designs of many famous doll makers including Steiff and Kathe Kruse. Thank you for a very informative, humorous, and fun program! Two members presented a program on children’s tea sets, dishes, glassware, and utensils. The program started with some information on the history of glass and glass production. The first known glass collection was from 1608. It wasn’t until 1825 when natural gas and coal was more available that glass production became more common. This is due to the fact that the fuel to make glass needs to heat to 280 degrees which was difficult to achieve by burning wood. We also learned about children's dishware. In the 1930’s and 40’s, some department stores would have tea and cake parties for children; their dolls were invited as well! This program featured an absolutely amazing display of children’s dishes and glassware. 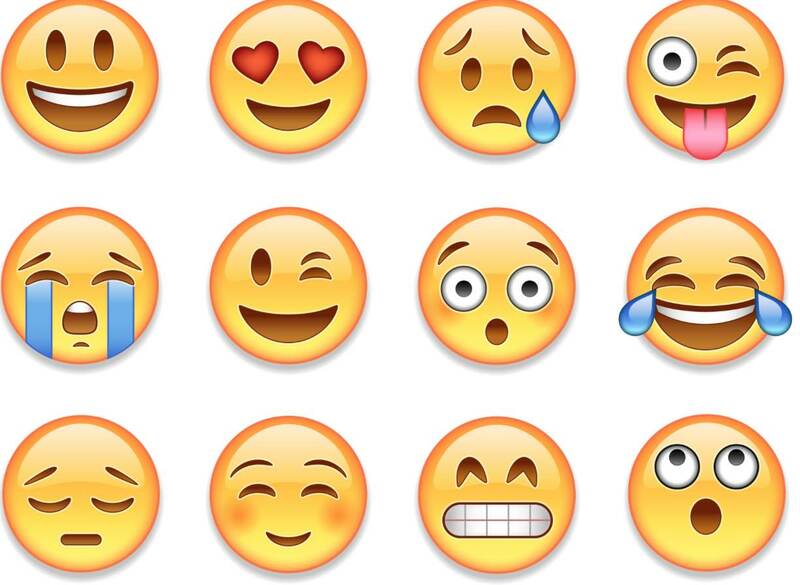 Thank you so very much for this interesting and beautiful program! 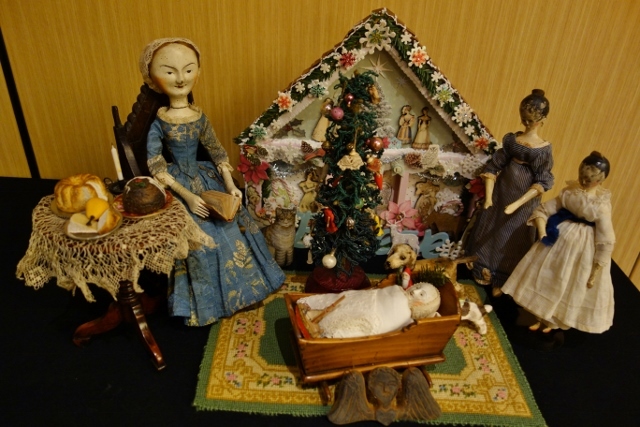 This meeting also featured our annual Christmas dolly display contest; the winning display of c. 1700 wooden dolls celebrating the holiday is pictured above. A colleague from the Cape Cod Doll Club presented Antique Dolls as a Secondary Product of a Primary Manufacturer: Darrow, Springfield, Rubber & Linen Head. Few rubber dolls are left due to the nature of rubber. She brought several rubber dolls to share. There were also examples of the very interesting wooden & metal Springfield dolls showing their joint structure. It is very rare to find a Darrow rawhide doll as rats tend to eat them! There were also examples of Linen Head dolls. Thank you so much for this most informative & interesting program. 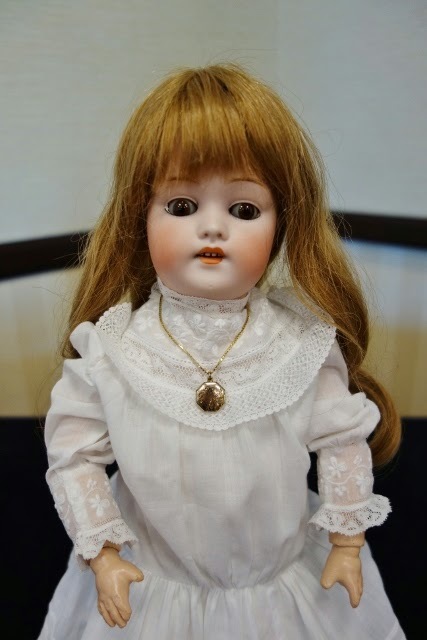 A member presented “A Treasured Find: A Doll Named Annabelle.” She told the story of finding a gorgeous French fashion doll on the Cape in a dusty antique shop. 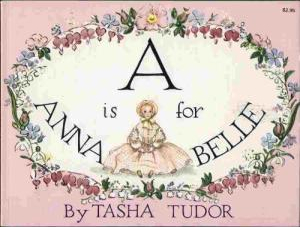 Annabelle the doll had an exquisite wardrobe and even included the Tasha Tudor book Annabelle that was signed by the author! Members brought their own treasured finds for show and tell. Thank you so much for the memorable program! Many members brought their summer finds or mystery dolls for show and tell. We were dazzled by the eye candy and the stories. Thank you everyone who brought a doll or dolls to share! A member presented a truly lovely and informative program about Dolls with Wardrobes. In the past many dolls with wardrobes were produced as high-end luxury items. 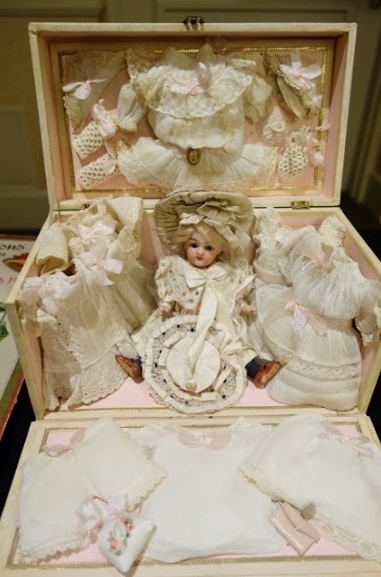 These dolls were displayed in wonderful presentation boxes with any number of additional items, such as tiny mirrors, hats, lambs, and tiny dolls for the doll to hold. We were treated to many delightful photos of dolls with wardrobes and actual dolls with wardrobes. Thank you for such an eye candy treat! Our annual fundraiser was a huge success and all had a great time! 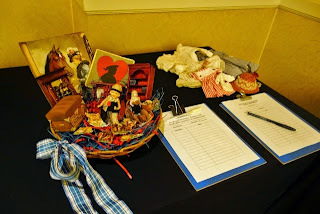 So many silent auction items rimmed the room. Tables were adorned with the absolutely beautiful doll dresses sewn by our members. Everyone received a table favor of an antique looking clock necklace that works! Our President opened the fundraiser at 10 am. Our UFDC regional director spoke about her duties as director, how our clubs support each other, and how her club enjoys coming to our Fundraisers. A past UFDC President and treasured long time DSCB member spoke about how she loves the club and how we welcomed her back with open arms after her time with UFDC. She intends to remain a DSCB club member for many years to come. The silent auction closed at 11:15 and shortly after the names of the winners were announced. After a lovely lunch Dorothy McGonagle presented the program “The Phantasmagoria of Jules Nicolas Steiner’s Creativity”. The program was full of beautiful doll pictures and interesting information about Steiner’s creative genius. On display were many examples of his work. A member then auctioned off the remarkable doll dresses we had all been admiring. Thanks to all who donated auction items. Special thanks to our seamstresses! And thank you all for a wonderful day. A member touched our hearts with the program “Family Dolls” which she dedicated to her mother. Her mother, along with her family, arrived in Chicago from England in 1910. As a young girl she received a lovely German doll for Christmas who she named Matilda Jane Gibbs. This was Matilda’s story in pictures, the ups and downs of being loved by a child, watching her grow up and going on to other things. Waiting inside a cedar chest for the longest time until her new mama arrived and then, more adventures! Thank you so much for this very sweet, heartfelt story. Family dolls are love that spans the generations. One of our members delivered the program on “Frozen Charlie’s” that she and another member had worked on together. As there are no real books about frozen Charlie’s, they spent a number of afternoons debating what were the telling features that would lead to knowing the maker of the doll. They studied clues like hand positions, painting of the eye, very defined toes and crease lines on thighs and arms. There is even a mystery “squiggly hair” group! It was decided that the main criteria is hand positions and characteristics of the eye painting. They displayed many different frozen Charlie’s. Chubby Charlie’s naked and shiny all lined up was a sight to see! In their heyday they were called bathing dolls and naked frogs. The February meeting was cancelled due to the amazing number of snowstorms that descended upon us. 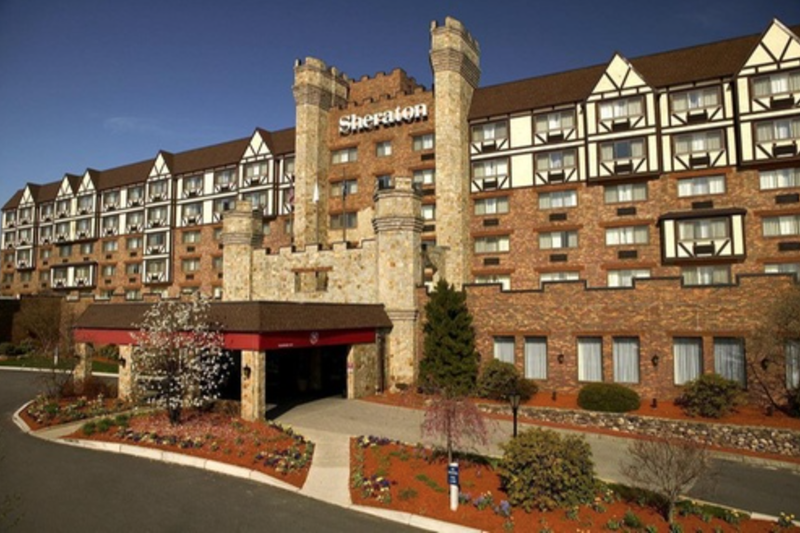 As it was cancelled early enough the club did not have to pay any hotel costs. 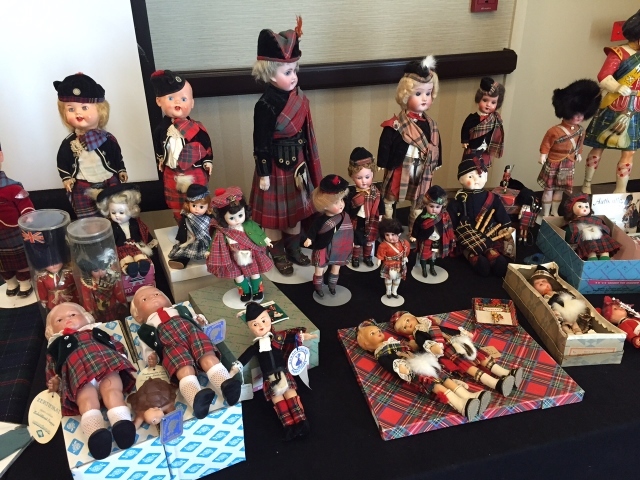 The program “Dolls in Tartan” will be presented at a future date, most likely sometime in the fall. 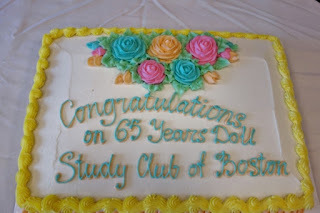 A club member gave a truly enthusiastic & informative talk about Wendy Lawton’s dolls. A few details from the program: 1971 was the year she began to experiment with cloth dolls, graduating to porcelain in 1977. In 1994 she produced wooden dolls. Many of her dolls were from children’s literature and fairy tales. In 2002 she received an honorary doctorate because of the books she wrote combining dolls and literature. Her company dissolved in 2010. Wendy is still active on the Yahoo “Lawton Loop” which began in 1999. It was wonderful to see the many examples of Wendy Lawton’s beautiful dolls that were displayed. “A Photographic History Featuring Children and Dolls” was given by one of our members. 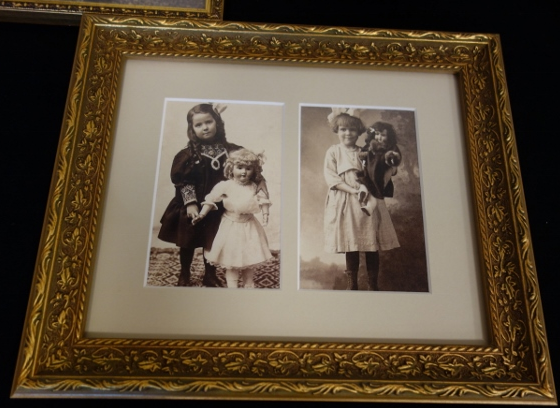 We were treated to a delightful array of very old photos of children and their dolls. We learned about the different types of photos, from daguerreotype to albumen prints made with egg white. At the end was a contest. 19 members had sent in old photos of themselves as children, many holding dolls. We all had sheets of paper with names & we tried to match them up to the photos on the screen. This was harder than I imagined! It was a really wonderful idea for a contest and we all enjoyed it very much. This month's program was called “Growing Up Schwarz” by Caroline Schwarz and Rebekah Kaufman. Rebekah interviewed Caroline about her family and their toy retail history. Caroline talked about what it was like working in the NYC store as a young person. We saw pictures of Frederich A. O. Schwarz and his wife, a very old German Christmas tree stand that rotates and plays music along with adorable exclusive toys from the store. “English Wooden Dolls, Then and Now” was our October program. One of our members gave a fascinating program about the history of English wooden dolls from the period around the 1600 and 1700’s. 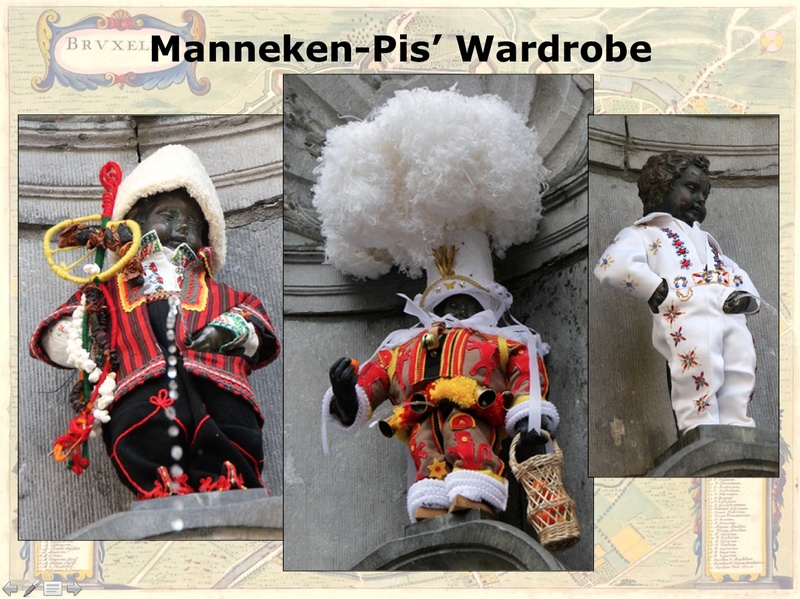 These dolls are usually around 21” tall & their hair is made of flax or human hair. 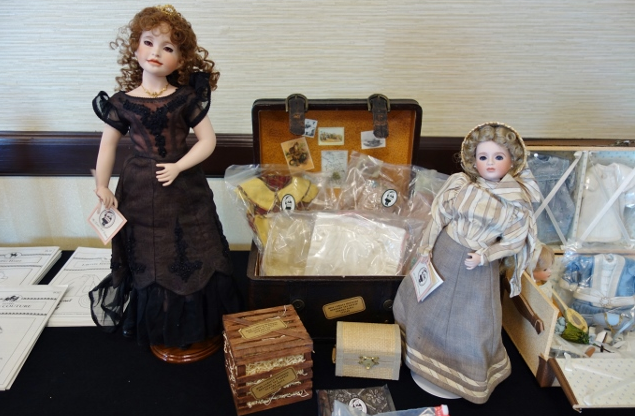 She told wonderful stories about these dolls, including one about a trunk of dolls found in England in 1973, which had been unopened for 200 years. Wouldn’t we all wish to be there for that! She brought stunning examples of reproduction artist dolls from this period. 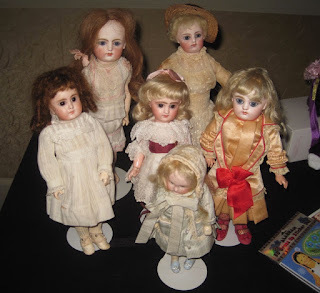 Also she talked about the doll artists of today who recreate these lovely dolls. “Summer Finds and Mystery Dolls” was our September program. One and all had a wonderful time seeing and hearing about the dolls our members brought. A special invited guest who is an authority on Kewpies presented a wonderful and informative program about these dolls with a colleague. 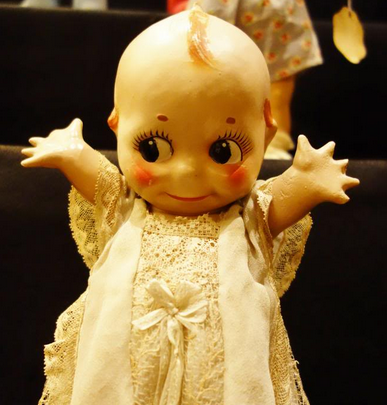 They have one of the largest Kewpie collections in the U.S. Their collection includes 350 bisque Kewpies. They brought excellent examples of all the different types of Kewpies that were produced for us to see. From tiny bisque figurines dressed in crepe clothing, to huggable, soft “Cuddle Kewpies” for children. The history of the famous illustrator Rose O’Neill, was truly fascinating. She first drew pictures of the Kewpies in her magazine drawings. People loved them so much, they requested they be turned into dolls. 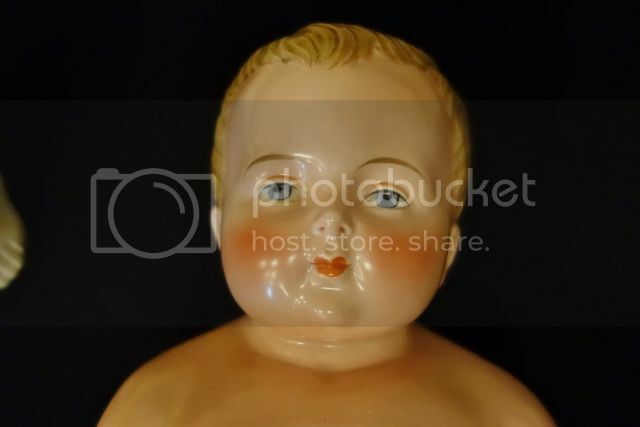 And so began the Kewpie Obsession! An interesting item is that our clubs president from 1955-1956, Rowena Ruggles, wrote the book “The One Rose."